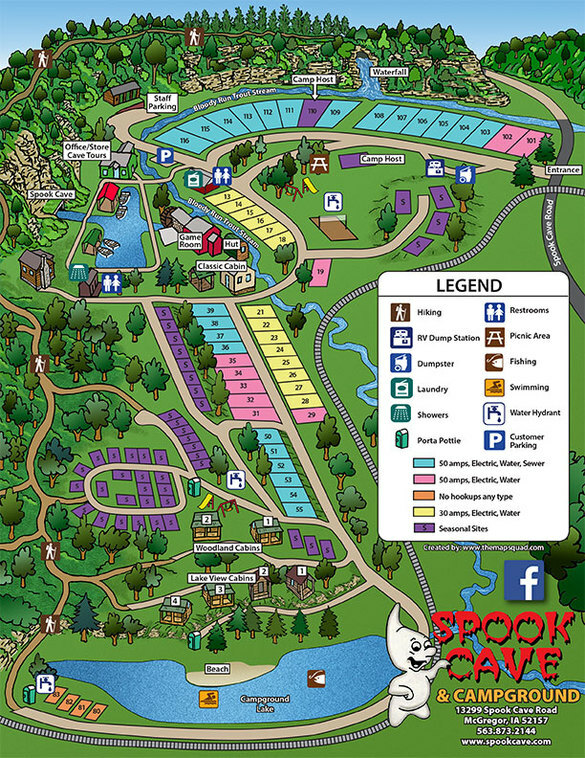 Spook Cave Tours, Cabins & Campground - Monona Chamber & Economic Development, Inc.
We offer spacious primitive sites along with full hook-ups. Featuring a shower house, laundry and flush toilets. Enjoy your stay: lake swimming with a sand beach, Iowa state-stocked trout stream, lake fishing, hiking trails, playgrounds, sand volleyball, game room and gift shop. Locally hand-crafted Amish Log Cabins; secluded and private; surrounded by trees, bluff, and lake; great view, sits on bluff overlooking Spook Cave lake; near trout stream; cabins sleep anywhere from 3 to 10 people.